Binsar not much heard of but a small and beautiful forest reserve in the hills of Kumaon. 35 kms from Almora in Uttarakhand is the green forested carpet on the lap of Jhandi Dhar hills. Road drive from Delhi to Binsar took 12 hours, through narrow single track roads. Tired we could not explore much but early morning we saw the beauty of the place, oaks, firs, pines, ferns rhododendrons....no traffic or tourist rush. Not much inhabitation...we were nestled in a jungle in the self sufficient resort of Club Mahindra in Binsar. Although the resort offered many adventerous activities like valley crossing, river crossing, rock climbing, rappelling, mountain trekking etc we preferred to drink the beauty of nature with nature walks and trekks to the nearby places. Patal Bhubaneshwar is a temple quite heard of 120 kms away and took us nearly 5 hours to reach the temple ...14 kms from Gangolihat in the Pithoragarh district of Uttarakhand. The underground cave was a bit scary at times as we had to crawl and roll to reach it. Kids were a bit scared but surprisingly they made it. This naturally formed cave has a history as it is believed that pandavas has stayed here during their exile. The formations on the walls speak a lot and are interpreted to the Indian epics and is very interesting to explore. The Zero point is a point high to be trekked for an hour. The forest lovers and photographers can find the route a paradise From Zero point the amazing snow capped Himalayan mountains can be seen, distinctly Nanda devi, Trishul, Kedarnath, Chaukhamba, Nanda kot etc. The rhododenderon flower seen in plenty here. Gananath is 25 kms away. The Mallika Devi temple & Gananath temple is located here. TheGananath temple is situated at a height of 2,116 m. On this route some of the lofty peaks of Nanda Devi, Trishul, Nandakhat, etc are visible. Chaukori is 80 kms away and is known for its high quality tea. Besides its a beautiful place with dense forests and snow capped mountains. Katarmal Sun Temple is 50 kms away and includes a 2 km on walk across the River Kosi to reach 2,116 m where the imposing temple is located. This is the only sun temple in the Kumaoni region and the second in India. 60 kms from here is Jageshwar, the temple of Lord Shiva. The ancient stone temples are as old as the 9th to 13th century, and are encircled by the deep deodhar forests. It is one of the 12 jyotirlingas. Lord Shiva is said to have meditated here and all the women folk of the villages got attracted to the Lord. The men were not happy to see women leave their work and follow Lord Shiva. Hence Shiva assumed the form of a child, and is as so worshipped here. There are other temples of Dandeshwar, Navagraha etc here. 76 kms away is Ranikhet the queen of hills standing at 6,000ft. The 8th century temple of Durga devi here has over a million bells of various sizes and shapes tied by devotees whose wishes have been fulfilled. 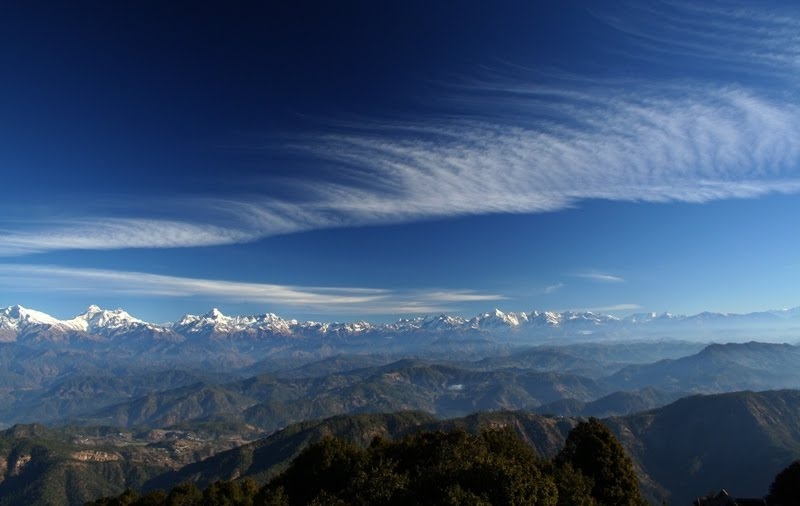 Trushul, Nanda Devi and Bandarpoonch peaks are visible from Ranikhet on a clear day. The Ranikhet golf course cannot be missed. 100 kms from Binsar is Dunagiri having the mountain temple of Shailputri and Brahmacharini. All newly weds do climb the 365 stepped peak to seek blessings of the goddess. Around 3-4 kms from Dunagiri is Maha Avtar Babaji's cave and the Yogananda ashram. As vehicles do not reach the top one has to trek for 1-1.75 kms to reach the cave. Nainital is also 98 kms from here. Although we have seen Nainital before we felt the pristine and unpolluted environment of Binsar was more attractive than the crowded Nainital. Had a wonderful vacation in this paradise.